Sometimes a regatta can come down to a moment, and for Jena Hansen and Katja Iversen, they seized the moment and claimed their first ever European title. 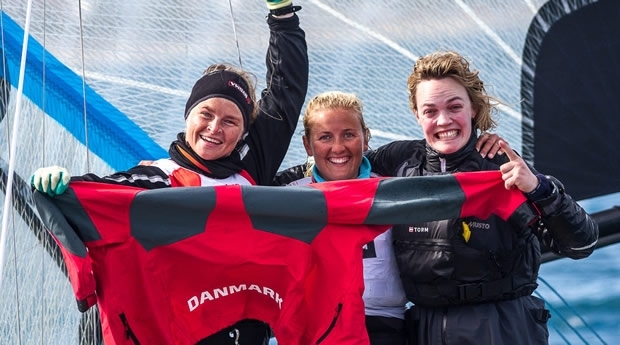 The Danish duo trailed Italians and reigning European Champions, Giulia Conti and Francesca Clapcich, by four points entering the medal race, meaning they had to beat the Italians and put one boat in between them. On the first beat, the right was favoured and the whole fleet headed that way, with the Danes in second following the British, but critically, with the Italians just on their windward hip. After a long drag race where the Danish sailed a fairly high line, the Italians had held on, but were just behind. As the British tacked on what appeared to be the layline, the Danes and Italians had critical decisions to make. “We were happy to see the British boat there as we thought they might need to be the boat we pass to get a boat in between,” said Iversen. “When they tacked, the layline looked close, but we wanted to tack underneath in case we could make it and we didn’t want to give the opportunity to the Italians. We pulled off the tack and Conti did the same, but we and the British were too far ahead, so we could roll them and they ended up having to do two more tacks, giving us the gap we needed." In that moment, the Italians fell from third, a regatta winning position, to seventh by the windward mark. They fought bravely back through the race, but could only catch two of the boats causing them to come away with the Silver. The Italian disappointment was evident: “There will be no more chances to be European Champions, as we will retire after the games,” said a clearly disappointed Conti. Her team mate consoled her, knowing there would be the greater prize to shoot for on the horizon in Rio. This medal race marks the second in a row that has not gone well for the Italians, who took a terrible turn in the 2016 49erFX World Championship in Clearwater and got stuck in a hole for five minutes while the rest of the fleet sailed past them. The race today was lost in a much more typical fashion, but is no less heartbreaking. Elated by the finish were 2016 World Champions Tamara Echegoyen and Berta Betanzos, ended up tied with the Argentinian crew of Vicky Travascio and Sol Branz on 101 points, but claimed the Bronze medal by having the better medal race result. The Spanish crew was leading the regatta after day four, but had two poor days in a row to drop out of the hunt for the overall prize, but were nonetheless happy to bounce back and claim a medal on home waters. Home waters were good to Spaniards this week, as Diego Botin and Iago Lopez also claimed the Bronze in a great medal race performance for them in the 49er. These young guns have been on the rise for all of 2016, rising up to fifth during the 2016 World Championship before their team mates match raced them back, due to an internal trials. They followed this up with a third in Palma, and now a Bronze medal at the European Championship and the top European at the European Championship. Out in front were Kiwis Peter Burling and Blair Tuke, ever present champions in the 49er, followed by London 2012 gold medallists Nathan Outteridge and Iain Jensen, who sailed very cleanly into the silver medal position and are gearing up for another big run with only four months to go until Rio. Burling and Tuke wrapped up their 4th straight European Championship and 25th straight 49er regatta win by a huge margin. The Kiwis led the regatta from start to finish, and never looked within the reach of any challengers. World number three-ranked pair John Pink and Stuart Bithell claimed their first podium finish of the year with bronze at the 49er European Championships, which drew to a close in Barcelona today (16 April). The British Sailing Team duo, who took silver at the 2015 edition of the event, concluded the six-day Open regatta – which permits off-continent entries – in fifth place overall and as the third European crew. “It’s always nice to step on a podium, but there’s still plenty of work to do and some sharpening up on things,” explained the 470 class Olympic silver medallist Bithell, who’s aiming for selection his second Olympic Games. Among the Brits, after a strong start to the week, John Pink and Stuart Bithell went into the final day as the second European crew, fourth overall, but hit some bad luck in the fleet races staged ahead of the medal race. This left the British duo as third Europeans, fifth overall, heading into the final double-points race – a position they consolidated with a third place in the race. The next regattas for most of these teams are the Sailing World Cup in Hyeres in late April and the 49er and 49erFX South Americans in Rio, over 11-14 July.